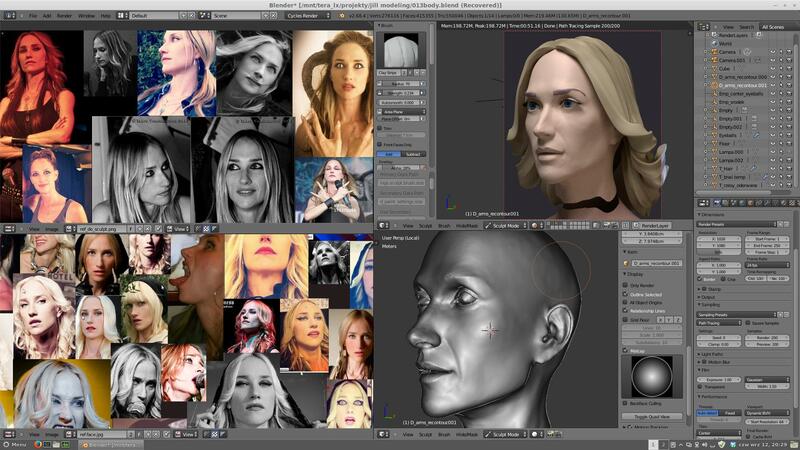 I’m making portret of beautiful and terrifying lady, Metal Goddess … Jill Janus, vocalist of Huntress. Above you see the hair test render. Raw render without any postprocessing. Still struggling with the likeness. Now the model looks like her sister or something. But I do not think I can do it better, because I dont’t have any specially captured images as “bluprints.” As for the character, I still gotta finish paint texture and improve the rigging and then take care of the environment and props. i think you are doing it very good. Oh, it’s funny that suddenly there are two Huntress chicks in the wip. I think that even if you won’t be able to get the exact likeness from the model itself(however I think that you have captured most of it), you will definitely have the opportunity to fix everything with the lights, rendering and environment by capturing the mood. Yes. I’m new here. At the moment I’m doing Huntress - is already one in the WIP. Previously, I made a model and animation of toy truck - and this is already one in Finished projects. Another toy but the same peterbiult! I decided not make thread. I’m afraid you will think that I am a copycat. looks incredible so far, can’t wait to see more! Looks really good! Liking the hair. Yep really good job !! I think that for the likeness you could check out the jaw line, somehow in the photos it seems a bit stronger than in the 3d version. Keep updating us! Wow, this is seriously impressive realism for a WIP! Even if it doesn’t end up looking exactly like her, it definitely looks a lot like a person. It may not make it out of the uncanny valley, but heck, to even get as far as you have currently is outstanding! And that hair is flipping amazing! I thought it was a paintover or composited on top at first! Sorry for all the exclamation marks, I’m just blown away by this. Hi ikkiz. Your model is incredibly well done. 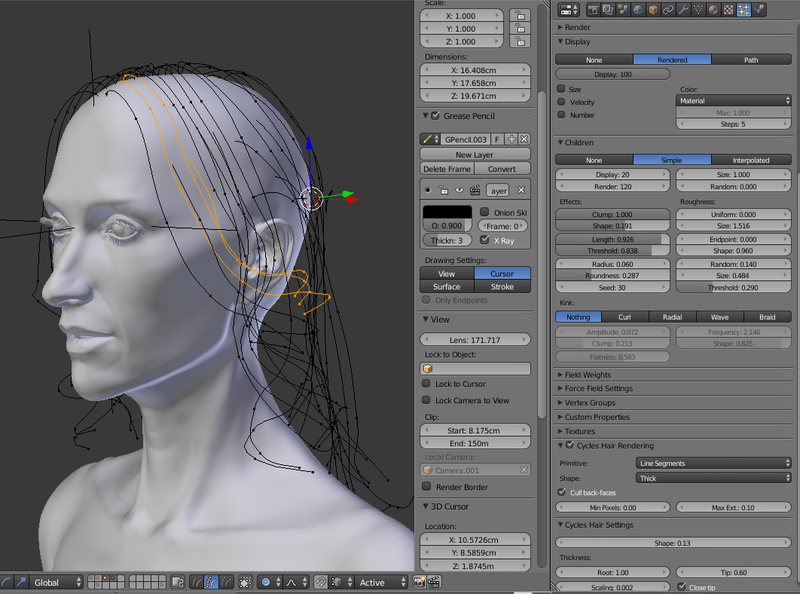 In my opinion her texturing (skin, eyes, lips) and hair are really impressive. I would like you to share some time how you have made it. Ok, but forgive me my english. I’m not a native speaker, and it is a little embarrassing. I feel dumb because I have to use simple sentences. So, first of all my workflow is very messy, but fortunately Blender is very forgiving in this matter. 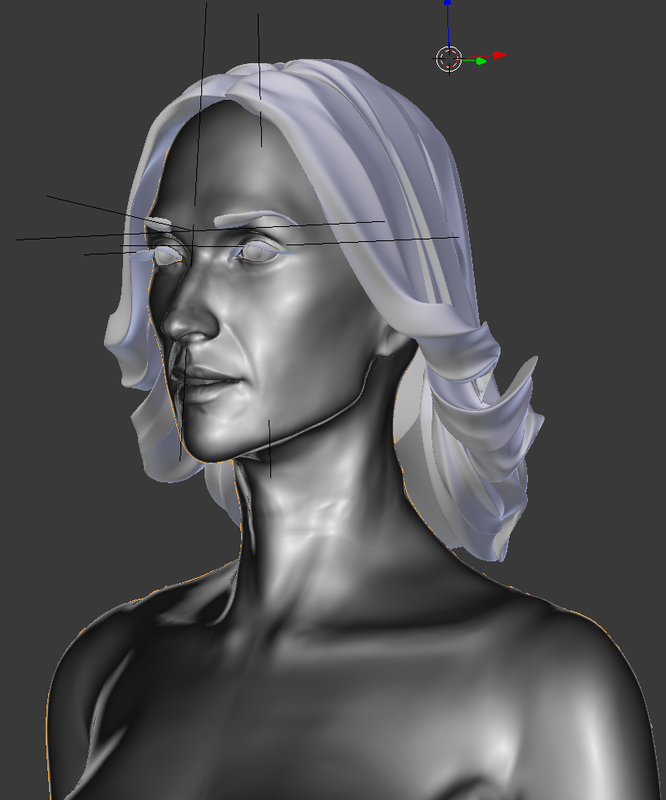 First I tried polymodeling on her head. Just as I modeled the Lady Mechanika. it looked pretty good as a statue until I have added texture and it turned into a disaster. I have not kept renders because they were offending this beautiful woman. 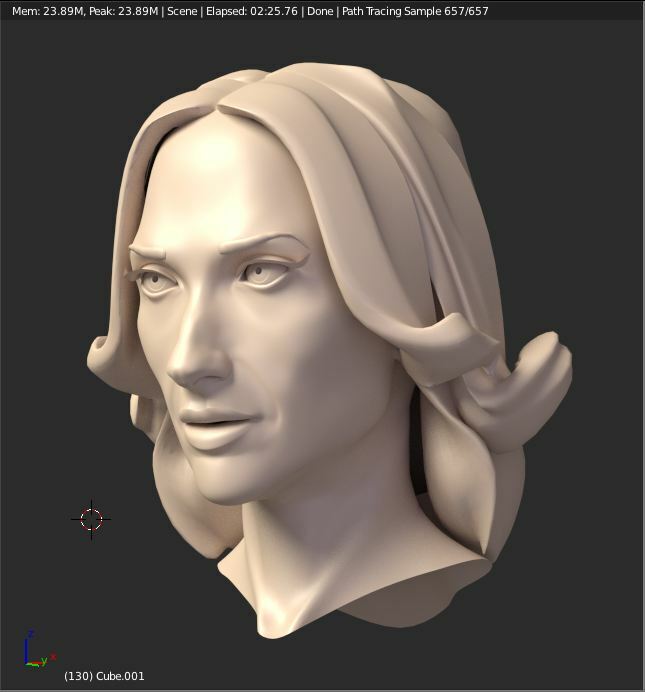 I separated the head as a separate object (as shown in the first post) and started dynamic topology sculpt. It is easier for me than multiresolution sculpt. And it is easier to get to the likeness to real person. Then retopology over dyntopo object, and added two new modifiers to the head. Multiresolution (3 Subdiv) and shrinkwrap. If you apply Shrinkwrap preceded by the Multiresolution, details are “baked” into multires. It was a great surprise to me that it works that way. It is a killer feature! You can also join nad bridge two objects with the same level of multires and then smooth “welding” using sculpt mode. The same way I have sculpted, retopologized and joined feet and hands, however some ugly picks on multires did apeared, it was not so easy to smooth them out. Hand is much easier to sculpt than foot. While sculpting foot i had to mask and hide a lot to sculpt in-between the toes. 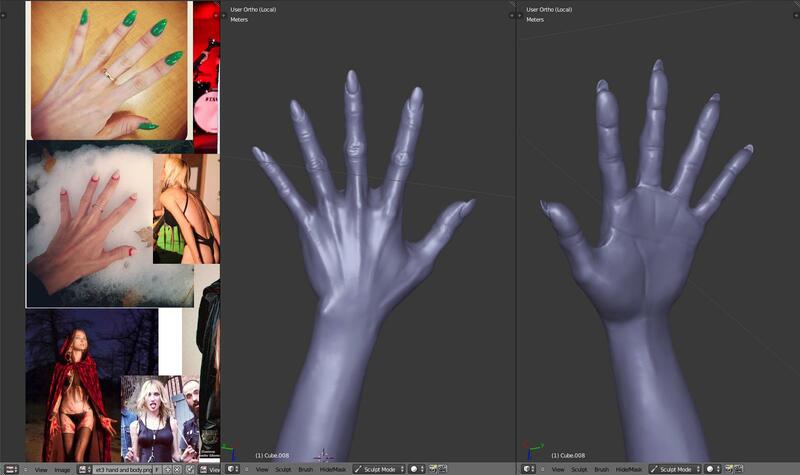 I have been using cgcookie contour tool for retopo of the hand (fingers), but retopo of the foot it’s nightmare. I can also show you how I made the eyeballs and hair if you are interested. What I mean is, that the breast shape doesn’t look right. At least without a bra and for my personal perspective. If she is going to war something in the future (I would leave like that lol) than it would fine, as a naked model “physics” would come into play. I will cover her breast with her arm because I’m not going to show too much. I will also use some shape keys to fit breasts to hand and arm. This model is beautiful and very artistic. They are combed by hand or did you use some styles? You do not quite understand, what you mean styles? But there are 3 particle systems. Main blond locks, darker strands covering breasts, and “rebel” one, to break procedural look. I’m not sure if I used a hair BSDF properly. No documentation.